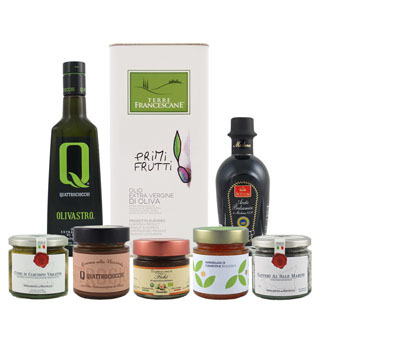 Produced exclusively from organic olives grown on the Quattrociocchi Estate, this extra virgin olive oil is medium-intense in fruitiness with a powerful and strong aroma, characterized by vegetal notes, green grass, mint and rosemary. Its taste is fine and balanced with a flavor of garden vegetables and dried fruit with a strong, pungent finish. Made by crushing organic olives and chili peppers during production. Organic aromatic extra virgin olive oil fused with aromatic truffle. Made by crushing organic olives and lemons during production. Organic aromatic extra virgin olive oil fused with rosemary.